The Pullars are one of the last families using traditional methods to fish for wild Atlantic salmon off the coast of Scotland. When these methods involve killing seals, the salmon’s natural predators, conflict erupts. Animal activist groups Sea Shepherd and Hunt Saboteurs oppose the Pullars at every turn, despite the legality of the fishermen’s actions and the consequences to their livelihood. Challenging preconceptions, this ambiguous doc puts modern environmentalism under the microscope. “We've had locals reporting to us that they shoot seals when they are hauled out on the beach, so nowhere near the nets. So they are shooting for fun rather than when it's absolutely necessary.” Jessie is part of Sea Shepherd, an environmental activist group whose mission is to promote animal welfare whatever the cost. Having discovered that the Pullar family, traditional salmon net fisherman from Banffshire, Scotland occasionally kill the seals that hunt the fish they depend on for their livelihood, her team of volunteers rally to protect the coast’s wildlife. “They kill everything for fun. They kill seals for fun. They are psychopaths”, she maintains. “This is a fishing village, always has been. This is one of the oldest salmon netting stations in Scotland. This is Scotland's heritage. Would you like to see that going down the drain?” Despite John Pullar’s attempt to defend his living and explain his family’s position, Sea Shepherd and international animal protection agency Hunt Saboteurs continue to oppose the Pullars, filming their every move to gain support for their cause across social media. As it transpires, and contrary to what the activists believe, the Pullars are not at all the brutal murderers nor the animal haters they are made out to be online. Jessie affirms that “one of the guys in the boat there, when a sea bird is caught in his net. He likes to take the wings off it alive and throw it back”. Her loyal sidekick Giant goes as far as cutting the fishermen’s nets to save birds who have become entangled. “That's criminal damage”, states Kevin Pullar when he sees what they have done. “That was a razorbill. You can get it out other ways without damaging the net.” Sure enough, Kevin and his brother continually save birds wherever possible, freeing them with skilled hands while keeping their nets intact. A further point of contention between the Pullars and their opposition are the leader nets that ensure the salmon slip inside, which must be removed over the weekend by law. When harsh weather prevents the fishermen from sailing out to the nets, however, they can legitimately remove the leaders at a safer time. Rather suspiciously, the water bailiff who patrols the area has been forcefully removing the leaders when he sees fit, slashing through the Pullars’ nets. When the Pullars realise that “Sea Shepherd already had this on their Facebook”, they can only conclude that “for them to know before I knew, it says a lot about the bailiff's actions up here. They're obviously working in cahoots with them, together with them”. 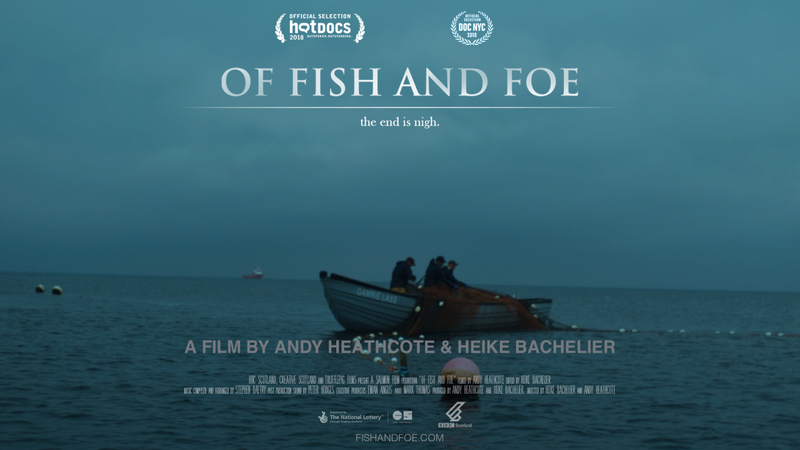 Andy is a British independent filmmaker specialising in documentary feature films. After taking a photography degree he trained as an assistant film editor for three years, working on commercials and corporate projects and in television news and current affairs. He has attended the Northern Film School and the Polish National Film School in Łódź. His previous titles include The Moo Man (2013), The Lost World of Mr Hardy (2008) and English Goodbye (2000). Heike started her career as a live director for the television networks Tele 5 and WDR before becoming junior producer at the Colonia Media film production company. There she developed documentaries for WDR, ZDF and Arte. In 2007 she founded the film production company Trufflepig Films. In 2010 her feature documentary Feindberührung premiered at the Hof Film Festival. We knew the ancient tradition of salmon net fishermen had become controversial. We did not know we were walking into a battle-zone. The fishermen were tough, hard working guys who we came to like and to respect. The activists were often fearless in their aim but also surprised us in their ruthless dedication. It opened up a new question; does the end justify the means? 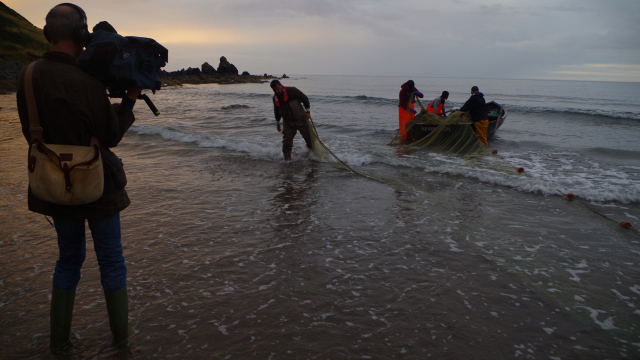 And so followed a summer filming along the rugged Scottish coastline, often in the 'cobles', the small open boats. But who'd have thought we'd need thermal underwear in the middle of July? Andy and Heike's previous film The Moo Man was nominated for the Grand Jury Prize at Sundance and Best Documentary at the British Independent Film Awards.